Paris is filled with carousels throughout the city. This one is found outside of Hotel de Ville in the Marais. I named this one Martiene’s carousel for a sweet little girl I knew in Paris who loved riding it! Paris Street Art found while wondering the streets of Paris. I find myself dreaming of Paris a lot these days… Anyone else out there? Doing things a little differently today. This past week while in NYC I dined with my friend Lauren. 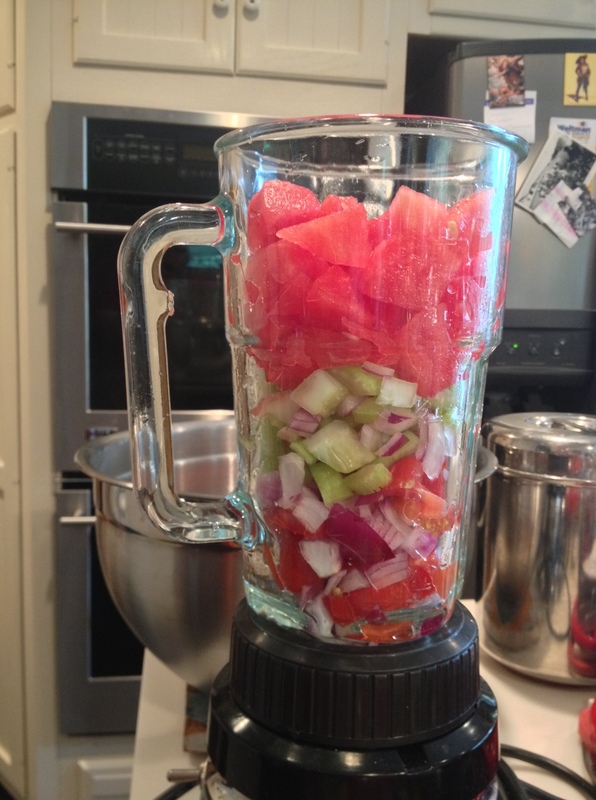 Since the city was so HOT, I decided to try a watermelon gazpacho on the menu. It was delicious! When it came to preparing food for dinner in the country my Aunt (who is a fabulous cook) offered we try to make the gazpacho. 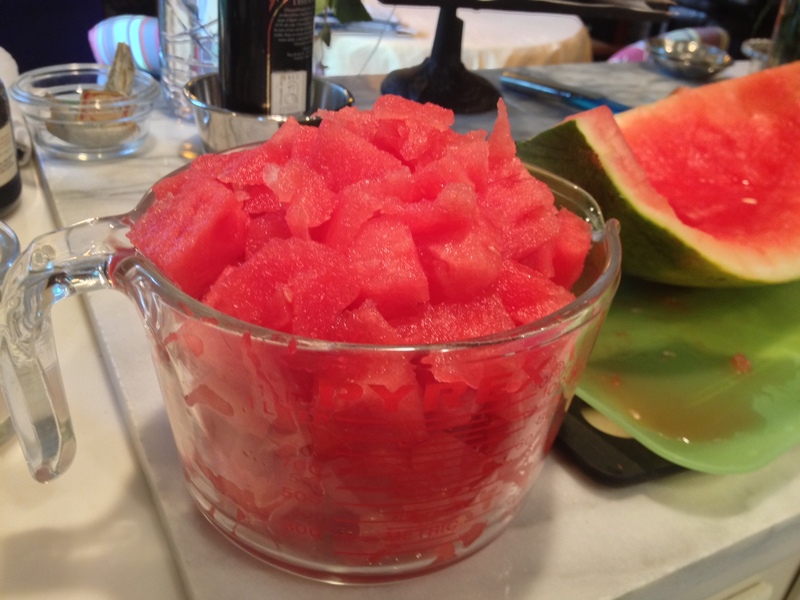 I hope you enjoy this summer recipe as much as we did! 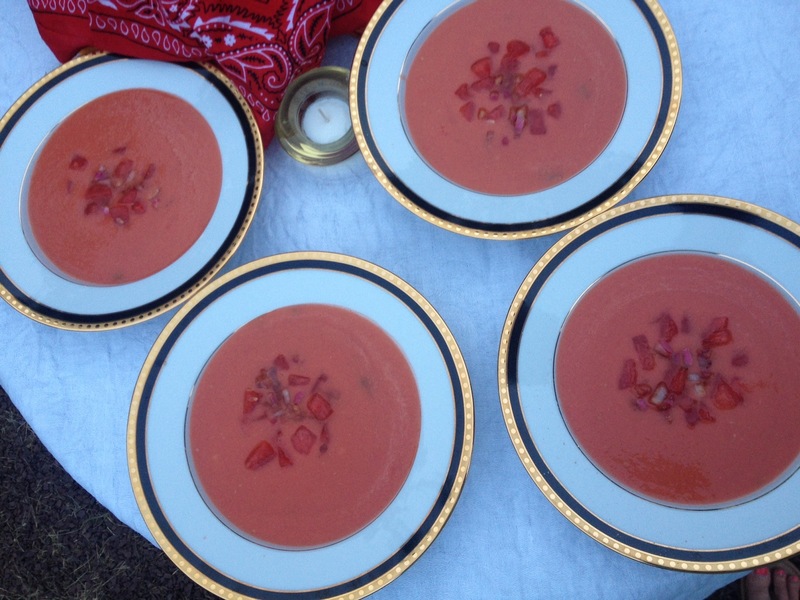 This is adapted from a watermelon and tomato soup in Anya von Bremzen’s wonderful book “The New Spanish Table” and we in turn adapted it from Martha Rose Shulman’s New York Times recipe. 1. Working in batches, purée all of the ingredients except the garnish in a blender for two minutes or longer until frothy and smooth. Taste and adjust seasonings, making sure you have used enough salt and lemon juice for a vivid flavor. Transfer to a bowl, and chill for several hours. Taste and adjust seasonings. Serve, garnishing each bowl with thinly sliced celery or, if serving in glasses, with a thin lengthwise slice of celery stick. Yield: Four to six regular servings, or 8 to 12 aperitifs. I love visiting markets in different cities. I was a regular at the Paris food markets and I was excited to give the NYC markets a try. I loved the Union Square Market. The fruit was amazing and since I spent the weekend with family I was able to share with them too.